Woman: “I have 14 children, Groucho”. Woman: “Because I love my husband”. The most generally accepted version of the “Cigar Story” was that it took place on radio in 1947 during the show’s first year. A “Mrs. Story” was the supposed contestant’s name. But other sources claim it occurred on TV and the lady’s name in that case was supposedly “Mrs. House”. However it supposedly happened, literally thousands of people have claimed to have either been there in the studio or heard it on radio or TV. This is, of course, impossible. If it ever did occur, it would have inevitably been edited out before any actual airing. The ribald gag was much too crude for radio or television in those times. So, at most, 200 people (the capacity of Groucho’s studio audience) could have actually heard it. Despite Groucho himself denying he ever said it, in the 1976 book The Secret Word is Groucho by Groucho, “Groucho” says: “The story, however, is not apocryphal. It did happen.” Confused? Unlike the 1972 Esquire interview, this book was largely ghost-written by biographer Hector Arce and he may easily have put these words in Groucho’s mouth. By 1976, the year of the book’s publication, Groucho was pretty much a shell of his old self, having survived a few strokes. The poor man could barely string together a coherent sentence in his final year (Groucho passed on the next year, 1977), let alone properly edit Arce’s work for content. 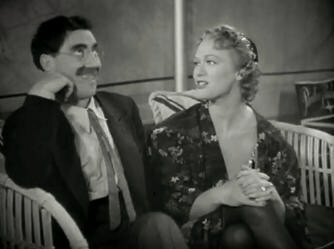 The truth is, the “cigar” remark, taken at its burlesque show level, wasn’t really Groucho’s “style”. Groucho would definitely make an occasional off-color or lewd remark in private. And as we all know, Groucho’s sense of humor and mind were amazingly quick, fertile- and hilarious. But on the air, Groucho was the consummate pro and it wasn’t like him to make a remark like that in front of an actual studio audience, who may well not have appreciated the crudeness; and he’d know it would never make it on the air anyways. In the end, there is no record or transcript of the legendary exchange ever actually taking place. And as Groucho, before his body and mind started failing him, stated he never actually said it, we can pretty safely say it never happened. Daughter: “Oh, my daddy just loves children”. This rather innocent exchange may possibly have been the actual source of the now infamous “Cigar Story”. Most of Groucho’s best “ad-libs” were written in advance by his group of comedy writers. The writers themselves would meet and interview the contestants for the show, then they would would write the clever “Groucho” quips on cue cards and Groucho would read them off before the studio audience, making them sound fresh and original. It is true, though, that Groucho did not meet the guest contestants before the show’s taping. I saw the show in which Groucho made the statement and it was to a Spaniard gentleman. He stated, “I like my cigar too, but I take it out once in a while.” I remember this as if it were yesterday. Thanks James!!! I saw it also and I too remember it like it was yesterday!!!!! While their does not seem to be a clip of this cigar joke in existance, saying he would never say something “dirty” like that in front of an audience as it was not in character is as false as your “bonus fact”. There are plenty of outakes from You Bet Your Life that are just about as “dirty”. Even a feeble attempt at a little research before writing this would have shown that. The que cards in question was actually an overhead projecter they could write on to pass messages along to Groucho to move the show along when he would go on to long about something, so they could keep the show moving along. As for scripting, again some research would have been a good idea. One of the problems he had in radio early on was sticking to a script. He scared sponsers and was considered risky as they never knew what he was going to say. The basis, and origin of You Bet Your Life came from his ability to ad lib. Anyhow, he definitly was not by definition a dirty comedian, but he was a great at getting listeners/viewers to think the “dirty” stuff for themselves while sounding fairly innocent himself. I also saw the show where Groucho absolutely did say the cigar comment! Perhaps he denied saying it because as he got older, he was embarrassed by the remark! There may not be any definitive proof, but like James, I know. What I saw and heard! I had never heard the cigar joke until one evening back in 1977 or 78 , local UHF channel in Philadelphia ran episodes of You Bet your Life at 10 or 10:30 pm. Sure enough he tells the joke to a couple wiating to play the game. There were 3 UHF stations braodcasting in Philly at the time Chnl 17, 29 & 48. It was one of those & I’m leaning into WTAF as the station that broadcast it. I saw it on TV. It happened. I was watching a rerun of You Bet Your Life. It was June of 1975. Two friends and I spent a week at Newport Beach after we graduated high school. I have a man that works for me and he is 82.when this aired he remembers it like yesterday and as soon as it was said they stopped the show for a few seconds. I won’t spoil the answer for you as it was hilarious, but Bob Eubanks swore for years he didn’t remember it happening and that it was an urban legend. When he was finally shown the clip on a talk show, he finally relented and was surprised he didn’t remember it. All these people claiming Groucho actually did make that quip… and yet not one of you can post a link to it? Being one of the most infamous lines supposedly spoken on the early days of television, and the fact that some of you claim to have seen it as recently as the late 70’s, means it would have been saved in an archive. That means it would also have likely survived to end up on the internet. Sorry folks, it just didn’t happen. I’ll take Groucho’s word over your false recollections. There are a lot of missing Dr Who episodes from the 60s. Does that mean I can’t say I saw them since I can’t provide a link to a video clip? Many shows that were rerun in the 70s are long gone today. Not all of TV was saved in an archive. My husband saw the show live and YES he did say this, in essence. The words were slightly different but it was when they did LIVE shows and it was yanked off the air quickly. Yes, I agree. I saw the show and he said the cigar story to a woman. The show went blank right after he said it. Really funny at the time…sometime in the ’50s and it was a live show. Like some others that have already left a comment, I too saw it as a rerun. I was not alive when the show was on the radio or in first runs on TV. And he did make the comment and the contestant was a man. But since there is some controversy over it and Groucho denies it, it makes me wonder if the whole thing was staged? Maybe it was actually a bit. I would explain why so many claim to have heard it on radio and on tv and why the genders vary from man/woman. And Groucho denies it, because to admit it would be to admit that some of his bits, contestants were fake. I am 70 and I saw it about ten years ago on some comedy special. The clip exists and it is a male contestant. I saw the show and heard the commit. 1961 I think it was. I was only 11 years old and remember my dad laughing out load about it. I asked what he was laughing about, but he said that if I remember it later on in life that I would understand it, but right than I was to young to have it explained to me. Well, being the kid that I was I asked my older sister of 4 years and she explained it to me in such a way that I thought it wasn’t funny at all, howerever, I found out that the man he said that to took Groucho to court and was awarded a large sum of money for Groucho’s commit. Large families were not yet out of style in those days, but making fun of them was. I also saw it back when I was a kid and remember it like it was yesterday!!! The Newlywed Game episode, the “answer” given making whoopee in the rear. That is obviously not what the question was intended to ask about. He did say it, I watched that TV show. Of course it wasn’t the first airing of that show, you are correct that the censors would not have allowed such a comment to make it onto air. I saw the episode in reruns, many years later on a local channel here in the S.F. Bay Area. But he did say it and it is in the Unedited or Director’s cut if you will version of the TV show. I thought so too. I remember watching this on TV a re-run. It was a man. It was not about pancakes, it was about the cigar. Another story about Bob Hope. On his radio show a woman said, “I’m pulling your leg.” Bob said, “just don’t pull Mr In-between.” The line got cut. He absolutely did say this. I know for a fact and have the episode on dvd. He was interviewing a couple and he asked how many children did they have. She said i ahave eleven children. He said why do you have so many? She replied because i love my husband. Then he said. Well i love my cigar but i take out one in a while. After that they had all eleven of the kids come out. My father was one of those kids. It’s amazing how many things that never happened people can remember like it was yesterday. Maybe they remembered it only yesterday.